I went in to see JF with my treasure. If anyone would be able to recognise a piece of Australian ceramic, it would be JF. If that fails, he has all those books on potters' marks and stamps that I was ready to pore through. I unwrapped my treasure and he said, "It's a Susie McMeekin?!" Oh wow, is that right? I turned it around and showed him the potter's mark and JF corrected himself, "It's a Steve Sheridan, he's Susie's brother-in-law. Ivan McMeekin's son-in-law." JF confirmed that I had done well, A$5 for this bowl which would have fetched a couple of hundreds. What can I say - my 5 months in Freeland Gallery have not gone to waste. I've honed my eye! After all Ivan McMeekin is one of Australia's most distinguished potters, and so is his daughter, Susie. I've done quite well indeed, for a piece I've picked up at a random garage sale, 5 metres away from my unit, just a few weeks ago. JF concurred that the form was lovely and it was a very nice celadon glaze. I can't wait to find more treasures. I am looking forward to bringing F a new friend. I think she will be pleased to see him. The last night before I fly off. Just had dinner with mum, she felt bad about being addicted to her Korean serial which she had blown me off for. So she succumbed and said we could leave before the show ended. Miracles never cease! The cab I had booked in advance didn't arrive. Thankfully, another cab happened to pass by and I didn't have to wait too long. The flight was uneventful, the food was forgettable, the shrieky kid in the seat across the aisle from me shut up after a while, thank God. I watched 2 movies, "Premonition" and "Music & Lyrics", both were pretty good, I particularly enjoyed the latter. Soppy, funny with those hip-thrusting 80s dance moves. Very nostalgic. Upon arrival, I expected to be hit with a cold and windy Sydney. It was surprisingly pleasant, with a fresh nippiness in the air but overall good weather. I think I might have brought good weather back with me. I could hardly get out of bed. It wasn't too cold walking to work, but I soon feel tired and sleepy after lunch. I had to shop for groceries because the pantry is EMPTY. After I made a quick dinner of thai coconut rice and a thai spicy steamed fish (ready to microwave of course) as I was spooning in my last mouthful while chatting on the mobile phone, the lights go out, together with my TV and internet connection as well. Oh no, power failure! I checked my fuse box, none of the circuit breakers tripped up. I go out into the balcony and spot a neighbour with a torch, and spoke to him. His lights are off too, but the units flanking us in the same building have light. Left messages for the agent. Neighbour has gone to check the main switch board, I didn't see him come out, must have missed him. After an hour, I see him getting into his truck, he said he had rung the power company, there was some power trouble in our neighbourhood, so it's not isolated to our block. The power company assured him they would fix the problem by 11 pm, another 2 more hours. Neighbour drove off, probably to the pub to kill time and stay warm. I pop a melatonin, pull on my bed socks - might as well have an early night by default. After about 20 minutes, the light I left on in the bathroom comes on. There is light! Drama over. With 2 more days ahead of me here, my bags are pretty much packed. I'm bringing back more things, as I know I'm going to be in Sydney for a bit longer now. I am expanding my wardrobe with clothes that I can now fit back into, including a couple of new skirts that I've bought couple of years back and immediately decided that they were too tight and never saw the light of day. I'm finishing up the rounds of lunch and dinner with friends (only the very special ones had encore meals with me, other people had to be satisfied with just one meal, requests for repeat meetings were met with nods and smiles and fobbed off with "I'll call you"). Well-meaning friends here, having not seen me for 4 months and horrified at the physical damage stress had inflicted on my face, have plied me with face creams, face masks, stress relief serum which I've faithfully packed into my suitcase to be checked in, being very careful not to have excess liquids in my carry-on bag which will subject me to severe customs regulations. Friends in Sydney have been emailing with weather updates, warning me about the severely cold winter they are experiencing, preparing me and my body for the shock after equatorial Singapore and the humidity I've had to endure the last 2 weeks. I'll be discarding a pair of leather mules which have been well-loved but had died a sudden death on this trip, I'll leave my clogs here too. And I'll be bringing back 2 pairs of brand-new leather shoes and a pair of old red suede shoes. New and old, all intertwined. In more ways than one. Old clothes, new clothes. Old shoes, new shoes. Old friends, new friends. Old memories, new memories. Old life, new life. Out with the old, in with the new? I'm still keeping my old things, bringing in new ones, letting them conmingle and co-exist, complementing one another and making the other better. As I was feeling under the weather with a throat infection and lack of sleep over the past 3 weeks, Y and I had dinner at the hotel so that I can go to bed and rest without having to travel far. Szechuan Kitchen never fails to please the taste buds I think. We had simple dimsum type dishes with a boiled soup, topped off with a herbal jelly dessert to help flush out the toxins (much needed for me especially). It felt light and was good after the last few nights of heavy, greasy food. S and I went to the French Stall at my request. I had been fantasising about the escargot and the chocolate cake, even though I am not a big chocolate fan. The prices had gone up and the escargots seemed smaller, but it was still enjoyable. The chocolate cake was sweeter I felt, I preferred the less sweet, more bitter version of the past. 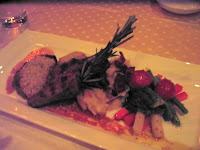 I had the pork fillet for my main course. That was one of my first cravings satisfied on this trip. Joint celebration with mum and the family at Graze at Rochester Park. The ambience was nice, with pretty and tranquil surroundings amidst the black & white colonial bungalows, I am glad the authorities preserved this area even if it meant turning the residences into commercial use. The food was pricey but the servic e was good a nd attentive. My seafood risotto was all right, nowhere as good as the mushroom risotto I get at Fifi Fouveaux's though. Mum complained that her fish was tasteless and "fishy". She didn't enjoy it at all. The scallop starter was very yummy and everyone else enjoyed their mains. I think the pork knuckle was especially delicious. Dessert was aesthetically pleasing but I didn't think it blew me away. A good experience, but I don't think I would come back again at these prices. Joint celebration with J at Perle Noire which was literally in our backyards. We were looking forward to a $30 set dinner. Unfortunately, we forgot that 17 June was Father's Day, seeing as both our dads are already gone and we don't have a reason to celebrate. Hence, no set dinner. I settled for a rack of lamb and J ordered a pasta. The lamb was pretty good and was presented in a pleasing manner. The main course alone set me back $30. I might come back for the set lunch or dinner, for better value for my money. With that, this ends the birthday feastings. I know I'm blessed when I recount all the meals I've had with friends and family every year when the special day comes round because I have a week or 2 of celebrations with people who are special to me. PS. Mustn't forget mum's home-cooked meal (I believe it was the only one during my trip home) of stewed pork with buns at my request. Yummy. And she made a soup too. Is it a natural trait of being human that we want the things we cannot get? Is it the thrill of the chase, the challenge of the achievement that make us this way? Why is life so difficult and why can't we be happy with a straight-forward, simple, uncomplicated existence? When things come easily to us, it that why we don't appreciate it? We ask for uncomplicated lives. But we shove it aside when it sidles up to us. And we actively search out the difficult, painful and complex ones. As I sat on the bus tonight, on a long, meandering journey home, a perturbing gut feel hits me in the face. A culmination of the last 2 nights of unwanted musings, late into the night, robbing me of much-needed sleep. I let the thought ruminate. Self-awareness kicks in. Logic and rationality stem the vibes. But the emotional and intuitive side doesn't quell. My intuition has been proven right on many occasions. This is one that I (logically) cannot allow to be proven right - if I want to keep my sanity. It's another of those nights where my active mind cannot be stilled. Thoughts which should have long been banished into the recesses of my memory, still float to the surface. Why they cannot stay hidden beneath, I am not completely sure. Am I in denial or am I still in recovery? Am I not done yet? The intensity of these memories is hard to suppress, so I get out of bed and succumb to the last tablet I have been saving. It is supposed to rest my mind and help me sleep. Put these thoughts back where they belong - in the deep, deep warehouse of my mind. In cold storage, not to be taken out easily. Maybe once in a very long time, and preferably such a long time, that I will forget that they are still there. And when I remember, it will be a surprise. I take the tablet. I wait. My eyelids grow heavier. But my mind? Do I still remember? Can I stop the mental dialogue in my head? Can I bury the memories? I need to. I want to. During the work week, we had a couple of nights out and of course they all involved food. On the first night, because TG had made a special request days ago when we were still in Sydney, for me to take him somewhere to find a big pao the way he remembers it from his Malaysia days, I had decided we were going to Dai Dong in Chinatown. Luckily they had a couple of those big paos left and he had his craving fulfilled. I had mine fulfilled too. We order Peking Duck, one of my all-time favourites. This one was ok, nothing spectacular but it was good in the sense that at least I managed to have one of my favourite food. After a full meal, TG and I took a walk around Chinatown to aid digestion while A went back to the hotel. We soon decided it was time for dessert. So TG had an ice kacang and was rather pleased with the huge mound of shaven ice with colour overload over it. I was happy with my bobo-chacha. The next day, the entire group met up for the most boring training I've attended in my entire life. It reinforced why Statistics is a brain-numbing subject for me at "A" Levels. The only highlight was when the 2-day course ended. However, we did go out for crabs at several people's request. Ended up at Jumbo, but not the usual one at East Coast, instead the one at Riverwalk. So there was still a water view but a river instead of the sea. We had quite a few delicious dishes, the cereal prawns were excellent, so was the crispy baby squid, scallop in yam and of course, the highlight - the chilli crabs. We were so engrossed in getting our hands dirty, I forgot the pictures. Some of us had the hashima dessert and there was a lively debate as to which part of what animal that was. I read somewhere it was slugs, someone said it was the gland of frogs (which I've heard of too) and finally, another person authoritatively said it was really the fats surrounding the ovaries of female frogs. Just because he said it with authority and had such details, it sounded like the truth! And it put off a whole lot of folks at the table naturally. But the ones who had ordered it, still dug in with relish!! It would take a lot to put me off the food I like. The group dinner on day 3 turned out to be a disappointment. Despite touting the steak as being really good, the $8 steak at Captain Cook in Sydney is infinitely more superior and a whole lot cheaper as well. I didn't like it one bit, too fatty, too tasteless. I can wait till I get back to Sydney to enjoy a really good steak. I guess one lousy meal after a couple of good ones isn't too bad. But I'm making sure I'm having more more more good ones in my time here. I've been back (for a moment I hesitated about using the word "back"- how weird is that?) in Singapore for a week now. The best part of that week was spent on work and with regional colleagues. And being sick. Down with a bad throat infection which saw me croaking for at least 2 days including the day I had to give a presentation. Raw, painful and being unable to swallow even saliva without feeling like razors being drawn down the insides of my throat for a few days, was absolutely no fun. But I think the worst has passed. Another couple days of antibiotics and better sleep (for the record, Xanax is super mild and doesn't do very much for me, Stilnox is much better, but the doc didn't have that and I also didn't want to hallucinate, open fridges and start gorging myself stupid and then not remember what I did overnight...) should cure me completely. I've had a couple of good meals, but not quite satisfying what I've been craving for. On the plus side, today I found macarons in Singapore! The minus is that they were too soft, too sweet and tasteless. Other minuses in the food arena are the lousy roti prata, nasi lemak and bak kut teh I've had. And Basil Alcove was actually closed when I went last Saturday as the chef/owner had to take a personal day off urgently. I need to make it up by having great Hainanese chicken rice, xiao long bao and other yummy stuff in the week to come. All my bags are packed, I'm ready to leave... Well not quite. I've packed essential documents and credit cards. That's all I know I haven't missed out. With a bad hangover from lack of sleep this past week, my brain isn't quite working at full speed. And not especially in the night - when my eyelids droop by 8 pm and I try to keep awake till it's decent time to go to bed. I've ticked off things I need to do on my list before I go. Uni is definitely safely out of the way, I've handed in all my assignments and attended my last class yesterday. The relief hasn't quite sunk in yet because work took over like a monster rearing its ugly head. I had a quick time out to celebrate last night - went to the national art gallery to see the Anselm Kiefer (German painter and sculptor) exhibition which was very interesting. I like the thick impasto texture of his huge abstract paintings. Almost like a sculptural painting in giantic proportions, and practically Impressionistically-executed. And then a bowl of steaming pho at my fave Viet cafe. By the time I got home at 9 pm, I was ready for bed. Today, MLA organised a surprise birthday celebration for me. I was completely taken by surprise because it was so not my birthday yet! But as I won't be here on the actualy day, the sweet child went out to get cakes and when I saw the cake box, in all innocence I asked, "Whose birthday is it?" and was told by everyone in a chorus, "Yours!" Ohhhhh... yay! I need better sleep, a nicer and bigger apartment, interesting things to get up to over the weekends. I can't wait. But first, the trip. More work, family, friends and food! Today was a good day. Got a high distinction for "Art & Cultural Differences" and managed to bind my 2 copies of my research paper in the print centre by myself without mishap. Went off to hand them in way ahead of the Friday deadline because I am not going to be here on Friday and have to work the next 2 days. So everything out of the way. Phew. With that out of the day and no real lecture today, I went for a walk. Explored Rushcutter's Bay Park, regret not having my camera with me. The bobbing sailboats would have made a pretty picture. Saw a couple of fish in the clear water. The water was incredibly clean. One more lecture tomorrow, a couple more days at work and then I'm off. As my mission was partially accomplished yesterday at the Surry Hills market, and my urge for markets was fuelled by all the tempting offerings there, I decided I had to go to the Bondi Beach market today. Having never been there, even though it's just a 15 minute bus ride away, I thought it was about time I explored what it had to offer. And another beautiful, sunshiney day today. Even though the sign at Bondi Beach claims the air temperature is 19C, it felt a whole lot warmer. However with the water temperature at 17C, I guess only the very bravest surfers are still going in. But if this is what the rest of Winter is going to be like, I am going to like it. A lot. So very different from what I remembered of last year. Bondi Beach market has a slightly different vibe from the Surry Hills market which is more village-like, sprawled in a little neighbourhood patch of park. Bondi Beach market is housed in a primary school, offering more clothes, bags and other accessories, with more emphasis on new stuff and less emphasis on retro household items and furniture. I spent a nice hour or more in the market, with a pitstop at the fund-raising sausage sizzle. I was served by two little girls (probably about 8 years old), the one who made my coffee asked me at every step of the process how I want my coffee (enough coffee powder? enough milk? 2 sugars?). It was very cute even if the coffee didn't turn out very good - and who could I blame since I was the one who gave the kid directions? I found the item that I was looking for. Well, I didn't really know I was looking for it until I found it. It was perfect for whom I have in mind. Sometimes, life is like that, isn't it? You don't know what you were searching for till you find it and then, it clicks. THIS is what you were looking for. It creeps up on you, or maybe it just suddenly jumps up in your face, waves its arms and whistles at you. Life is interesting like that. Second day of Winter. But what a gorgeous morning. I had to quickly discard my hoodie and after a while, my cotton cardigan as well, leaving only my short-sleeved top. It was unheard of in my winter experience. It was lovely weather to browse around the various stalls at the Surry Hills market, as with every time I go, temptations were everywhere. I nearly parted with a mere $45 for a 1950s low coffee table in an organic kidney shape, with spindley legs on castor wheels. I figured as the stall-holder was so reluctant to sell it, if I really wanted it, it should still be there next month. Then again, that lime-green lamp I was hoping to purchase this time round was no longer available, however there were other wonderful lamps that were on offer. But I resisted. I bought a cotton wrap dress, some beaded jewellery but did not find what I was looking for - a tiered cake stand. That was my mission. Unfortunately, mission failed, I have to report back to HQ to put our high tea plans on hold a bit longer. I spied a one-tier cake stand at Salvos later on, but it was badly chipped. So no go either. I stopped for a quick lunch at my favourite Bourke Street Bakery. This time, I tried a lamb harrissa (a type of spice blend) almond sausage roll and had it with a latte, sitting on a stool on the pavement, with the rest of the crowd lingering outside the tiny shop. The lamb sausage roll had the most unusual taste - the pastry was crusted lightly with poppy seeds and the sausage meat had a tinge of occasional sweetness, with almond flakes embedded with the meat. A closer scrutiny yielded up little blueberries which was giving off the sweetness. Ohhh it was good. Just that with a latte made a simple but filling lunch. With the sun lapping my face, I finished off the last of my coffee and ambled off into the sunshine. On my walk home, I couldn't help but stop in at the gelato shop. I was goggle-eyed at the variety. Should I be my usual stick-in-the-mud self when it came to these things and get a rum and raisin as always? Or should I be adventurous and go for something different? I decided to live life on the edge today and got a fig and rhubarb gelato. Very good. With dessert in hand, I finally was on my way home. But again, I got distracted 5 metres from my block. An elderly man was sitting in an easy chair outside his garage with paintings lined up against the wall. I really like one of them, it was made of fabric filled with a filling to create a puffed-up look of the images sewn and mounted on the board. It was a very retro-looking piece of work, 1985 the man said, from a girl who used to work for him. Unfortunately it is quite large and will take up my entire wall in the shoebox. I should have asked him for the price, I guess I can still go back as it is 3 minutes away from where I live. But I bought a bowl from him for $5 (salad bowl size). There was a potter's mark behind which needs investigating, maybe this is my moment, a treasure for a mere $5. I need to go check out the various reference books at the gallery and do some Nancy Drew sleuthing soon. I just love the markets. Do you see him in your dreams, as you close your eyes and try to sleep? Do you will yourself to sleep so that you can see him sooner? Is he still in your life or is he just in your dreams? Do you lie to yourself or do you see the truth? Will you ever forget him as memories fade with time, a black and white photo fraying at its edge as the image washes out with the passing of time. Or is he imprinted in your heart, an image that will not go away? Will you love him the rest of his life? Or will you love him the rest of yours?